Hi there! Long time no see! Or chat. Whatever! I've spent the last month in 'dye, dye, dye, reskein, label, inventory' mode for the Sock Summit! Everything is finally out to the Portland area (thanks Stacey!) and I can relax! So I've taken this week as a breather, but Saturday I'll be dyeing the last colorway for the Mythos club and Nate will reskein it all while I'm away so it will go right out to club members the moment I get back. Yay! I'll have sign ups for a new club at the Summit and then I'll present it to you all when I get back! 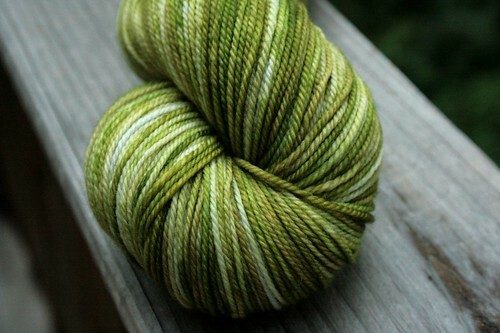 In case you missed it on Ravelry, there's a Dye for Glory competition in which all Rav members can vote on skeins dyed by vendors at the Sock Summit! There are a TON of gorgeous colorways, so if you haven't gone to vote, please go. You won't be sorry (but your credit card might). Hurry, voting ends tomorrow!! 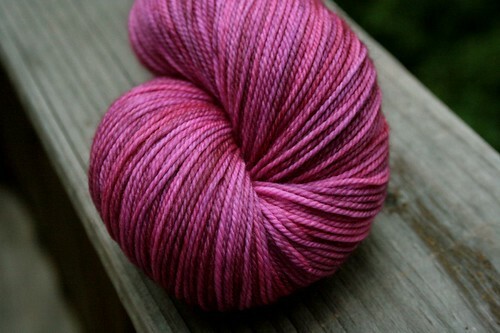 I dyed up a new line of colorways called Pin Ups using the cashmere/merino/nylon sock base (YUM!)! These are inspired by and named for classic and new pin up girls and I think there's a ton of room for fun and creativity with these colorways. Fun, eh? I love them all so much it was hard to pack them up and ship them to Portland. I also realized after packing that I didn't take pictures of the rest! But I'll do that as I unpack, promise. There are seven more and they're all really stunning! And there are more to come! The Etsy store is currently empty (it's so sad and lonely!) but whatever I have left from SS09 will go up right away and I'll be taking orders for everything that sells out. I've also been knitting. I picked up the Ishbel pattern the other day and cast on right away. 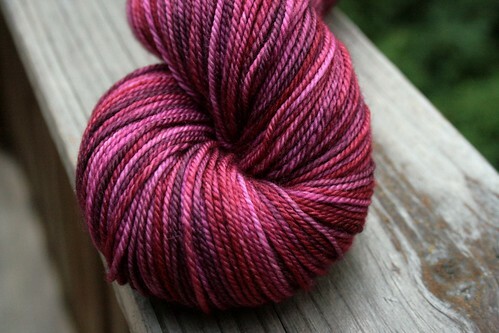 This is Dream in Color Smooshy in the In Vino Veritas colorway that I found at Stitches South a few months back. I think it's coming along nicely. 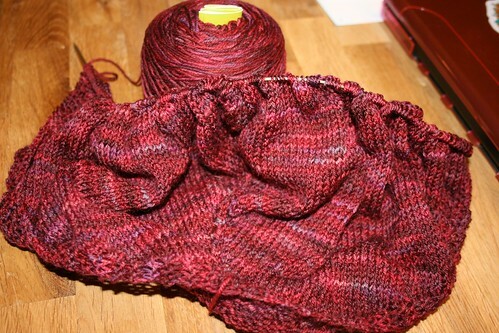 I've posted a few of my languishing WIPs on my Ravelry page. I've had them all in a basket for a while, so this week I sorted things out because the clutter was getting to me. There's at least one sweater that's almost finished and two more that need some love. I also cast on for another Shedir hat because I keep giving mine away! Then I have a pair of socks that I can't post because they're a surprise for my raffle winner. I'm to the heel on the first one though and it looks great! I've also been doing a bit of impromptu baking. 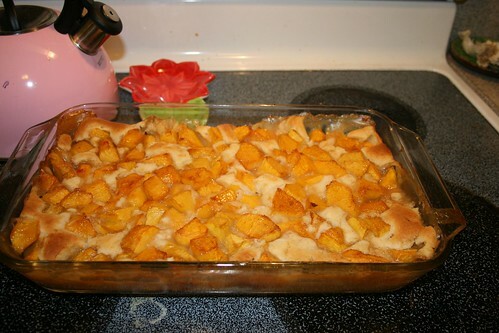 I found some GIGANTIC peaches at the farmer's market last weekend so I waited until they were super ripe, juicy, and a little squishy and cut them up for a big old fashioned peach cobbler. Oh. Em. Gee. It was sooo delicious. Not too sweet, just right. It didnt' last 24 hours. Seriously. Next week I'll be at the Sock Summit, and I plan to take TONS of pictures because I know so many folks can't make it. I hope to be updating daily here and on flickr so you can see the booth and the market, the World Record attempt, the Ravelry meetup, and the Luminary Panel. There's soooo much going on that I don't think I'll be able to make it everything, but I'm going to do my best! I'm totally nervous, but really excited too! I can't believe it's here so fast! SQUEE!